Whenever you hire someone new into the business, the process of introducing them to the company and the procedures that are in place, is completely vital to ensure your newest addition boosts productivity and is successful from the off. New recruits are undoubtedly going to be a bit nervous about starting a new role – no matter what their experience or qualifications – so it is important to nurture confidence so that employees can have an impact on the business as soon as possible. 1) Company culture. At Total Assist Group, we always kick off a new employees first day by having an in-depth induction meeting. To work well and towards company aims, it is essential that staff have a full understanding of the company culture and where the business sees itself. We make sure to discuss topics such as the history of Total Assist Group, our core values, present company goals and most importantly, how the individual’s specific role will contribute towards achieving these targets. We also try and arrange observations so that new starters can check out the activities of all the teams involved in the company and the different aspects of the business as this gives the ‘big picture’ so to speak, and a better all round knowledge of how we operate and interlink. 2) Education. Here at Total Assist Group, we take training very seriously, as we are keen to produce staff who are constantly and consistently learning to further their personal and professional development. Naturally, the more you know, the better you perform, so on top of basic induction training, new candidates also have regular sit down meetings with their line manager for more specific training that is related to the job role. Internal and online systems are always showcased and discussed so that recruits have all the techno skills they need too. When it comes to training new staff, it is so important not to rush this step, even if the colleague in question is in demand and needs to be brought up to speed quickly. You need to think about the employee as being a long term investment for the company, so the more you put in now, the more you will reap the benefits when the employee performs later down the line. We also run an educational academy programme at Total Assist Group, which takes intuitive and ambitious young people and actively trains them over an intensive nine week period how to be a successful recruitment consultant. With a mix of classroom and hands on experience style teaching, we use a variety of methods such as role play to really help shape these guys careers. With the right training behind them, these academy graduates can make some real money out on the sales floor, providing income for the business, so we really go the extra mile to pass on every inch of our expert industry knowledge to create knowledgeable and enthusiastic recruitment consultants. 3) Feedback. The main way that staff can monitor and chart their progression within a company is by using direct feedback. 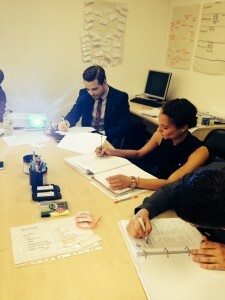 New starters here at Total Assist Group have a three month probationary period, which closely tracks performance. Regular review meetings are held after the first week, and then one each month where the employee in question gets to sit down with their line manager and one of the training team, to set new goals and targets for the upcoming month. This is also where current performance is evaluated, and advice and feedback provided so that new starters can actively see what they need to do to succeed in their position. We encourage the new employee to share how they think things are going, welcoming them to ask questions and provide their own opinions on their success or where they may need further training. Regular evaluations will help staff reach the top of the learning curve.